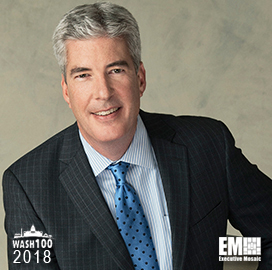 Executive Mosaic is pleased to announce Ted Sniffin, Executive Vice President and Director of Business Development at Booz Allen Hamilton, has been added as an inductee into the 2018 edition of the Wash100 — Executive Mosaic’s annual selection of the most influential voices in the government contracting arena–for his leadership in the firm’s defense and intelligence business, management consulting and program management capabilities. The technological rate of advancement has not changed significantly since 1991, Sniffin wrote in his internally-released “State of Defense Acquisition” article published in GovExec in 2015. “Embrace a multi-dimensional perspective. Challenge conventional habits and thinking. Unlock the power of data analytics to improve decision-making with objective, data-driven analysis across all dimensions,” he concluded. In his current role, Sniffin oversees the company’s support to the Office of the Under Secretary of Defense (AT&L), the Defense Logistics Agency, the Defense Advanced Research Projects Agency, the Defense Threat Reduction Agency, and the Defense Finance and Accounting Service. A member of the TRANSCOM Regulating and Command and Control Evacuation System (TRAC2ES) capability, Sniffin was recognized in 2003 with the Professional Excellence Award for his leadership in support of the U.S. Transportation Command. In addition, he was selected for the 2008 Booz Allen Excellence Award for client service. Executive Mosaic congratulates Ted Sniffin and the Booz Allen Hamilton Business Development team for receiving this award.